Battle lines have been drawn and wannabe politicians are hitting the streets in the countdown to what is sure to be a hotly-contested mayoral election. The make-up of Mansfield District Council could drastically change when the full council goes to the polls, with 36 positions for councillors and the mayor set to be decided by the electorate. Unlike other areas, Mansfield and District also has a directly elected executive mayor, with mayor Kate Allsop’s four-year term coming to an end. Mansfield District Council has been controlled by the Mansfield Independent Forum since May 2002. The forum has 16 sitting councillors and the mayor, while Labour has 17, the Conservatives have one, and there are two Mansfield South Independents councillors. Each council ward is under the First Past The Post voting system, while the Mayor is elected under the Second Ballot system, where the voter decides their first and second choice. In the election on May 2, five candidates will bid to become your next mayor, and your Chad has spoken to each of them about why they are the person for the job. Kate Allsop, executive mayor and Mansfield Independent Forum candidate, has been the district’s mayor for four years after her election in 2015. 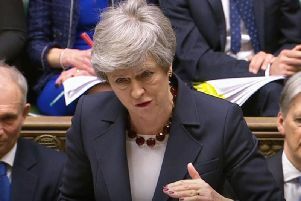 Speaking on why she should be re-elected, she said: “Like you I am bitterly disappointed with Westminster politicians letting us down, squabbling like children following the referendum to leave Europe. George Jabbour, Conservative candidate for Mansfield mayor. “There seems no appetite for the MP’s, most who voted to remain, to deliver the will of the people - no wonder we’re unhappy with mainstream political parties. “This election is about your local services, how they are funded and the consequences of losing 95 per cent of government grant by 2019/2020 because of Conservative austerity. “I am the only candidate with a proven track record of delivery, keeping Mansfield council’s element of council tax at no increase for nine consecutive years, yet still delivering vital services; we now share many of those to reduce costs. “It’s only by putting people before politics I can boast four years of achievement, driven by commitment, co-operation, creativity, challenges, communication and a commercial approach to running your council. Philip Shields, independent candidate for Mansfield mayor. “Don’t let MPs’ behaviours stop you having your say on how the district of Mansfield is run. George Jabbour, the Syria-born Conservative candidate for mayor, has experience in managing public sector finances as well as a background in engineering. He said: “Mansfield Conservatives have pledged to put more ‘pride’ into our community. “This includes proper planning – we will implement a new vision for Mansfield, ensure that all new houses are built in the right places, secure the long-term future of our parks and return leisure services to Warsop. Councillor Stephen Garner, independent candidate for Mansfield mayor. “For roads and transport we will work with Mansfield’s Conservative MP Ben Bradley and the Conservative government to extend the Robin Hood line to Warsop and address the congestion on Nottingham Road. “We will invest in Mansfield – the current administration of the council has spent tens of millions of pounds outside Mansfield in other parts of the country. We will stop this and invest locally in our town, introduce two hours free parking and support businesses. “Dealing with drugs and anti-social behaviour, we will appoint additional Neighbourhood Wardens, secure all parks owned by the council to prevent illegal camping and clampdown on fly-tipping. Philip Shields, independent mayoral candidate, was brought up in Meden Vale, educated in Mansfield Woodhouse, worked as a police officer and sat in Mansfield District Council’s cabinet between 2011 and 2015 - also standing for mayor four years ago. He said: “I am standing for mayor in a totally independent capacity. “My commitments include my cabinet being made up of members chosen by their own political groups and not by me. “This I believe will help in the decision making process. “I will introduce a three hour parking permit scheme across council car parks, to help attract more footfall into our town centres. “I will invest tax payers monies first and foremost within the district. If the Mayor won’t invest in Mansfield who will? Councillor Stephen Garner, Mansfield South Independents candidate for mayor, is Mansfield-born, has been a district councillor since 2007 and serves as a county councillor. He said: “I’m standing because so many people have asked me on the doorsteps to go for the mayor’s spot. “If I get elected I’m going to look into having a referendum on the role of mayor because so many people tell me we don’t need one. “I would need 4,000 signatures on a petition to trigger the referendum, which would take place on the same day as Notts County Council elections in 2021, and if it goes through I will quit my job the next day. “I’ll also look at cutting money from the council itself, such as the executive portfolio holders and backroom staff, because you’ll see public services cut but never cuts to the council itself. “I’m not just standing for this though, I want better waste collection, free parking in the town from 3pm and to cut back on council wards and streamline the number of candidates. Andy Abrahams, Labour’s candidate for mayor, is from Mansfield and has worked in local government, private industry and education. He said: “I am a local lad from Ladybrook who has raised and educated his family in Mansfield. “I have many life skills to offer having worked as a civil engineer on multi-million pound projects such as the channel tunnel rail link, and as a teacher and departmental head in schools. “Our manifesto is all about giving Mansfield a ‘fresh start’ after 16 years of decline. “We will invest in our town to keep money in the local economy by using local contractors and suppliers wherever practicable. ”Affordable homes will be built in locations that need regenerating, protecting our green spaces from out of town development. ”We will build our communities by identifying the worst areas of private substandard rented accommodation and make ‘rogue’ landlords accountable. “We will employ more neighbourhood wardens to tackle drugs and anti-social behaviour, and make Mansfield healthy, green and clean by reinstating sports facilities in Warsop, re-energising our parks and improving our waste and recycling facilities. ”Through a new council apprenticeship scheme, we will work with schools and employers help young people secure real jobs with a future. Below is a full list of candidates for each electoral ward. Andy Abrahams, Labour candidate for Mansfield mayor.